Nikola Corporation announced last week that the hybrid electric Class 8 tractor truck manufacturer had completed a $210 million Series C investment funding round. The Series C completion announcement indicates that investors oversubscribed its latest round of investment with an additional $105 million raised in November, with the two-stage round totaling $210 million. Supply Chain Matters last updated our readers in May in conjunction with a joint such Nikola Motor and Anheuser-Busch announcement regarding an order for up to 800 Nikola Two Class 8 tractors for daily driving routes. At the time, we opined that the announcement served as both a market endorsement of hydrogen-electric powered Class 8 trucks as a preferred strategy for sustainable-powered heavy-duty vehicles for transportation services and adding credence to investing in an industry disruptor that has definite manufacturing and infrastructure plans. Thus far Nikola has announced three different models, the longer multi-day travel distance hydrogen-electric powered Nikola One, the short-haul Nicola Two, and the recently announced Nicola Tre Class 8 tractors, the latter being targeted specifically at the European heavy truck segment. One of Nikola’s prime competitors, among others for early orders, is Tesla and its proposed Tesla electric truck. The original design called for a purely battery powered electric truck, but that design morphed to a combination of lithium-ion and hydrogen fuel cell powered technologies. Its planned trucks call for 2000 ft. lbs. of torque, up to 1000 horsepower and travel between 500 to 1000 miles before requiring a re-fueling. Refueling time is stated as 15-20 minutes. 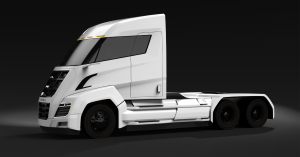 Nikola further indicated that the company has received pre-orders amounting to $12 billion, with $308 million for the recently announced Nicola Tre model. Founder and CEO Trevor Milton indicated to online publication FreightWaves that the latest financing round will be channeled into “prepping the truck for full production.” An incremental $1 billion round will kickoff in the first quarter of 2019 and is expected to last 4-5 months. The proceeds of that round will be focused on the six-year ramp-up of volume production at the company’s designated factory located near Phoenix Arizona. The company also has aggressive plans for its Nikola World 2019 event including the Nicola Two prototype in action and the Nicola Tre initial truck viewing. With Tesla yet to provide specifics on its specific manufacturing and augmented capital infusion plans regarding heavy truck manufacturing, and now with Nicola’s plans solidifying, the competitive pressure increases.